Foldable smartphone Xiaomi Mi Mix Flex live and almost officially! At the beginning of the year, the first information about the flexible Xiaomi smartphone appeared. At that time we were not sure that we were talking about Xiaomi equipment. We already have it today. 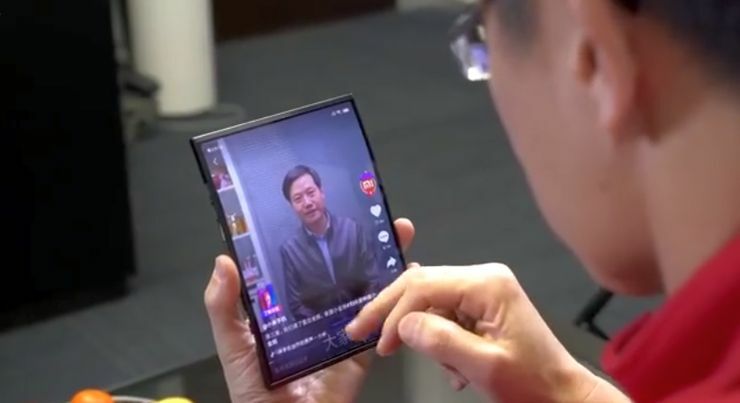 We are certain that the smartphone with a double folding screen was developed in Xiaomi thanks to the fact that in the next film the smartphone presents the co-founder of Xiaomi Lin Bin, and video was posted on Facebook by the director and the spokesperson of Xiaomi, Donovan Sung. In the film, we see a working phone prototype, the display of which can be wrapped "under itself" from two sides, transforming from a large screen into a classic, vertical telephone display. The interface seems to keep up with changing the shape of the screen and work quite smoothly. You can see only one slip - wrapped parts of the screen remain highlighted, although they should be extinguished. Remember, however, that we are watching the prototype. Source Facebook and Weibo; viewed: 536 times.